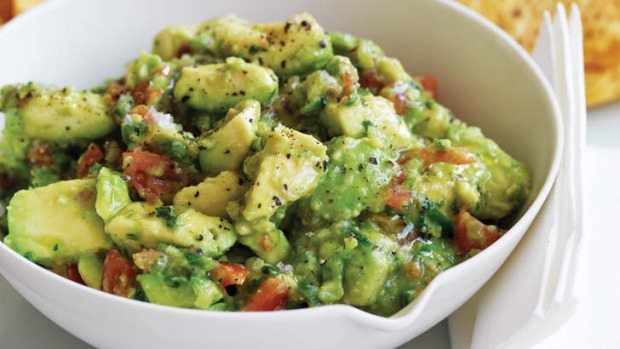 A little spice turns the avocado into a party. Finely chop the onion, chillies and coriander leaves. Place in a mortar with a generous amount of sea salt and pound with a pestle until you have a rough paste. Peel, stone and halve the avocados and add to the mortar, pounding until they start to mash. Add the lime juice and a good grind of pepper and fold through. Add the cherry tomatoes and fold through gently. If the mortar is an attractive granite one, serve the guacamole straight out of that, with a bowl of corn chips.